The Monday Night Football game will feature the Houston Texans traveling to the New York Jets. The Jets come into the game with a 2-2 record. New York was smoked against San Francisco on Sunday, which brought all sorts of doubt from the New York media. The Jets are tied with New England and Buffalo in the AFC East. For Houston, things have been great thus far. The Texans have won four straight to start the season, and have the largest point differential in the NFL to this point. Houston has scored 126 points and allowed just 56 through four games this season. The Texans have a three game lead on Tennessee and Jacksonville, while the Colts are 2.5 games behind. Let’s make some money betting on this game at this bookmaker! Will Houston be able to remain unbeaten? Houston has been the best team in all of the NFL to start the season. The Texans have wins over Miami, Jacksonville, Denver and Tennessee. Arian Foster is once again among the top running backs in the league, with 380 yards and 4 touchdowns in the early going. Matt Schaub has become a model of consistency behind center for Houston. The quarterback has tossed for 953 yards and 7 touchdowns. 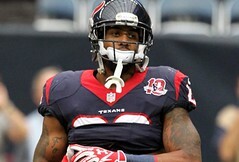 Andre Johnson, the team’s top weapon at receiver has two touchdowns, along with Owen Daniel. Houston takes on Green Bay and Baltimore both at home, before they go to their bye week; on October 28th. Do the Jets need to turn to Tebow time? After getting shut-out in the previous game against San Francisco, the Jets are looking to bounce back and get on the score board. Many experts are calling for Tim Tebow to take the place of Mark Sanchez. Look for Tebow to be ready in this game, but don’t expect Rex Ryan to pull Sanchez too quickly on MNF. Sanchez has thrown for five touchdowns, but most of those came against one of the worst passing defenses in the league in week one. The Jets smoked Buffalo 48-28 in week one. Following that game, New York lost to Pittsburgh and beat the Dolphins in overtime. New York is the fourth best passing defense, allowing 197.5 yards per game, but they are now without Derrelle Revis for the season with a torn ACL. Keep reading for our pick. Or if you are ready to bet – place your bet here. Wow – this game has the potential to be a great one. This also has the ability to be a one sided affair. The Jets are going to have to get better production out of their offense. The New York defense may be talented, but they do not have enough to slow down the Houston offense. Houston is looking to make a statement that no one in the AFC can compete with them. We feel Houston will win this game, but the Jets will keep the game close. We are predicting 24-20 Houston over New York. Therefore the New York Jets cover +7.5, and the over 41 hits in this game.